If the Liberals should win the next federal election, these are the nongs who will be “governing” you. Do you think Mr Rabid realises what a bad look this is? 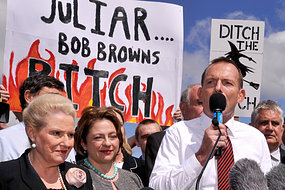 Gosh Bronwyn Bishop looks scary in that photo. I wish I could know what she thinks of Her Leader v Julia, PM. Yes, it was vile, homophobic, sexist and witless.Worse still, it was infantile. Iknow I’m no orphan myself as to some these flaws, but watching it coming from them in such a blatant way, unabashed, before the public, seems to signify some sort of change. The antic had me in mind of the worst of the “Ewige” propaganda from the nineteen thirties. Hate speech at this level and intensity openly and even in valorised form, could presage more McCarthyism or even totalitarianism, were the global economy to take a big hit.